If you store your photos on the photo-sharing site Flickr, Karl von Randow’s Mobile Fotos app (previously available as Mobile Flickr) will help you not only upload new photos, but also keep track of the latest photos by friends and the wider Flickr community when you’re out and about with your iPhone or iPod touch. You can use Mobile Fotos to explore community photos even if you don’t have your own account; however you’ll want to log in to get the most from the program. The Camera menu lets you take a photo and upload it to your Flickr photostream without having to switch programs. The Upload option lets you choose from photos already in the iPhone’s Camera Roll. Unfortunately, the current version uploads portrait-oriented photos upside-down, making the feature all but unusable. (The company is aware of the problem and is working on a fix.) Another downside: the resulting uploads are a mere 640 by 480 pixels. The program fares better when it comes to exploring the world of Flickr. It offers a nice selection of options for drilling down through your photos, as well as those of your contacts, Flickr groups, and the general community. For example, the Search menu lets you limit your search query to a single contact, a single group, or to yourself. However, navigating through all of the program’s submenus can get tedious. For example, it takes a minimum of two taps to see any of your own photos and another three to see the details about one of those photos. To then switch to someone else’s photos, you’ll have to tap backwards to the first screen. It doesn’t take long to feel exhausted. The process of viewing photos is similar to what you’ll find in the iPhone’s Photos app. An Options button lets you save the current photo to your Camera Roll, assign it to a contact, add it as a Favorite in Flickr, or view additional details about the image. Switching to the detail page lets you see general stats such as the owner, dates, tags, and comments. However, I wish there were also an option to open the original Flickr page in Safari to see details not provided, such as the number of times a photo has been viewed or location data. Details are presented as a straight list, which makes them a little harder to read. That said, there are some nice touches here. Tapping on a listed tag, for example, will show you all photos by the contact with the same tag, offering an interesting way to explore further. Tapping on the owner’s name will take you to his or her Flickr stream. Combine these contextual links with the program’s other search tools, and there’s no telling where a curious user might end up. Which Way Is Up: A bug in the current version of Mobile Fotos uploads portrait-oriented images upside-down (as you can see with the photo in the upper left corner); the developer is working on a fix. 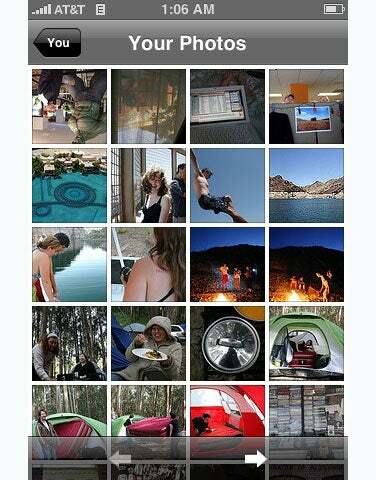 Mobile Fotos isn’t the only option for navigating Flickr from your iPhone or iPod touch. If you’re mainly looking for an easy way to keep track of your contacts’ latest photos and show off your own, you’ll likely prefer the streamlined interface of Connected Flow’s free Exposure ( )—or the $10 Exposure Premium, which strips out the ads found in the free version. However, if you enjoy exploring photos from the larger Flickr community and don’t mind how many steps it takes you to get there, Mobile Fotos may prove satisfying. But considering the serious flaw in the program’s uploading tools, it’s hard to justify paying $3 for the current version. Mobile Fotos is compatible with any iPhone or iPod touch running the iPhone 2.0 software update.